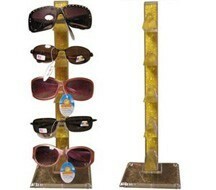 crylic counter top sunglass display rack holds 3 pair in yellow color. 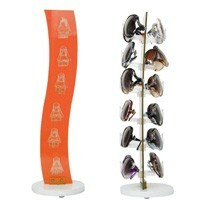 Height 10.5 in. x Width 5.5 in. 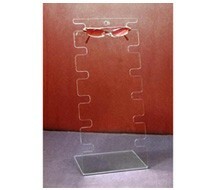 Acrylic counter top sunglass display rack holds 3 pair in red color. 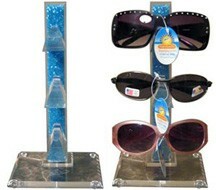 Acrylic counter top sunglass display rack holds 3 pair in blue color. 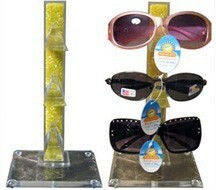 Acrylic counter top sunglass display rack holds 5 pair in yellow color. Height 19 in. x Width 6 in. 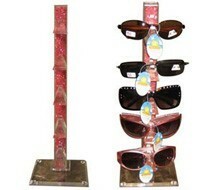 Acrylic counter top sunglass display rack holds 5 pair in red color. 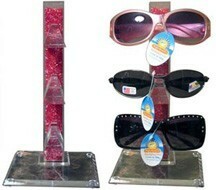 Acrylic counter top sunglass display rack holds 6 pair. 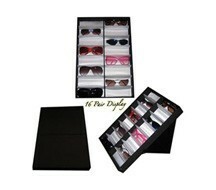 Folding sunglass display holds 16 pair. Great for people on the move who need easy setup and tear down. 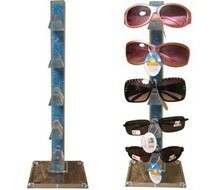 Measurements closed: Length 19" Width 12.75" Height 2"
Acrylic counter top sunglass display rack holds 5 pair in blue color. Acrylic Counter top rotating sunglass display rack holds 12 pair. Height 18 in. x Width 8 in. Height 18 in. x Width 6 in.